Well, I couldn’t really run a series on thrifty breakfasts without including porridge, could I? Not only are porridge oats a low-cost option (a 500g bag of oats costs around 65p), but my trusty tiffin allows me to make three bowls at a time. I get to be Goldilocks. There are lots of porridge recipes out there. The purists point to the original Scottish version, made with water and salt instead of milk or cream. I thought about going there but in truth, when I make porridge I plump for compromise: half water, half milk. Add the oats, liquid and salt to a saucepan. Plain porridge suits me fine but is a devil to photograph: even with the nicest lighting, it looks like boring beige gloop. 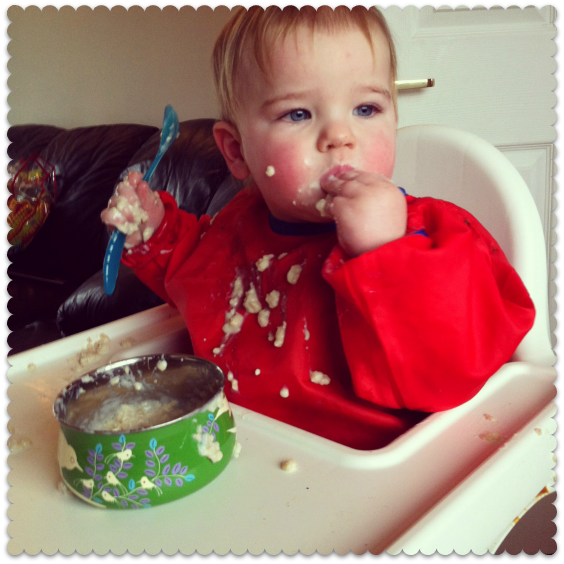 Fortunately porridge takes five minutes to make and five seconds to dress up a little. 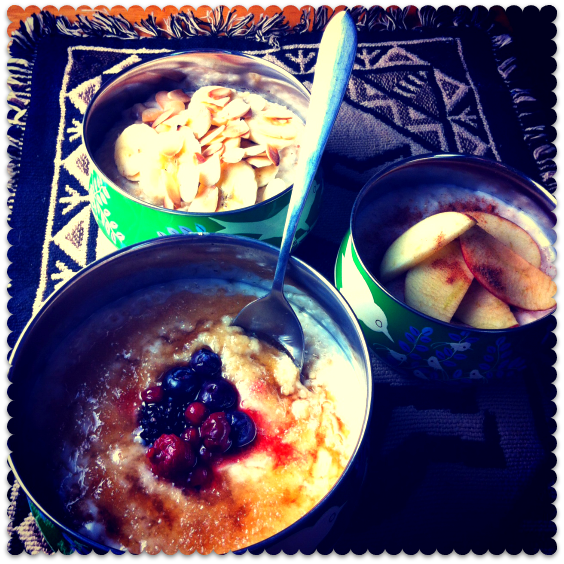 Plain porridge with fruit and brown sugar. I added a few redcurrants, raspberries, blueberries and blackberries, from the £1.50 tub of frozen summer fruits I opened earlier in the week, for the Homemade Honey Nut Granola breakfast. Even if you don’t have brown sugar, do be sure to use granulated: such a satisfying crunch. I have read porridge recipes in which the cook spoons sugar on top of the porridge and then nukes it creme brulee style, with a blowtorch or grill. I wasn’t going to try that with a handpainted metal tiffin bowl, but I bet it tastes delicious. Almond and banana porridge. A revelation. I made this porridge for the first time, using some of the Alpro almond milk I was sent. When I was on an enforced dairy-free diet I tried almond milk in coffee and in pancakes, but never porridge. Now I know I missed out! I hadn’t tried almond milk in porridge before, but it worked well: it tasted surprisingly creamy. All I would say is, this porridge was thicker than porridge made with regular milk or water, so if you make it with almond milk I’d add an extra slosh. I used sweetened almond milk but unsweetened is available too, depending on your preference. Just before serving, I stirred in some small chunks of banana, and topped with some banana slices and also a few flaked almonds, which I had toasted in a heavy-bottom pan on the hob. Apple and cinnamon porridge. Chopped apple stirred in just before serving; sprinkled cinnamon and sliced apple on top. I got a big bag of porridge oats with my Nectar points the other day for free! We make batches up – with a teaspoon of castor oil – for our chickens. They love it, lay us tasty eggs some of which we sell to our neighbours for £1 a half dozen. ‘Do the Math’ as they say. I love porridge and have it every day – I just use water though and it tastes fine to me… I always add a little bit of cinnamon, ginger and chopped up bananas. Lovely! I like to add the contents of a couple of crushed cardamom pods to my porridge before cooking it! 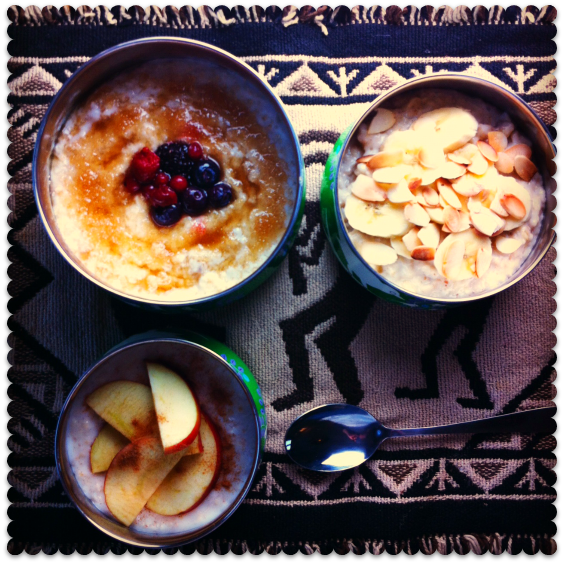 Thanks for these great ideas to change up porridge! Will help me get thru these winter months brrrr!!! I bought a bag of porridge oats only the other day! I used to have it very frequently and always used milk. It never occurred to me to use half milk and half water to save money. I have some bananas too so I;ll give this a go.